García Márquez first editions at Los Martires. 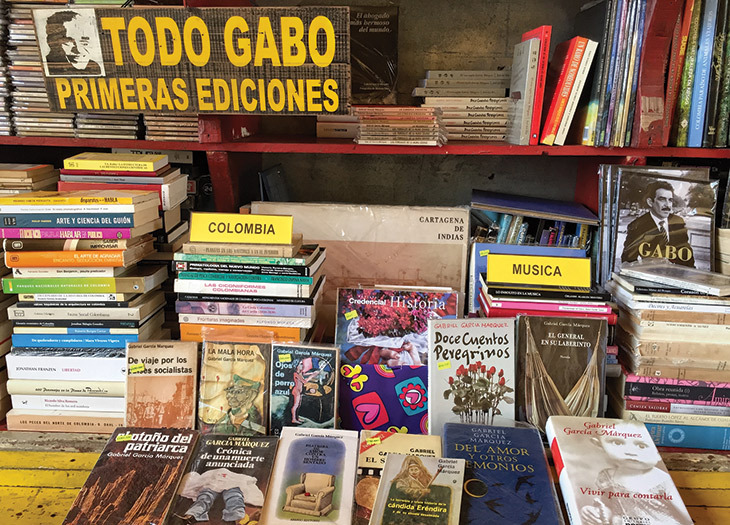 Exploring Gabriel García Márquez’s literary landscape in Cartagena. Rooftop views from Casa San Agustín. Art and life not only imitate one another in Cartagena, but the two are so inextricably bound that they coalesce into one beautiful blur. A visit to this port on Colombia’s Caribbean coast quickly reveals how it inspired the works of the country’s native son and Nobel Prize-winning author Gabriel García Márquez. Known by Colombians as “Gabo,” the godfather of magical realism called the city “the most beautiful in the world” and noted that all his novels held threads of Cartagena in them. 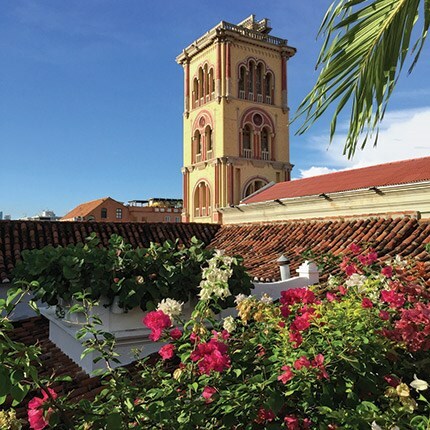 Adorned with flower-accented balconies, colonial churches in pastel hues, and a sixteenth-century Old City still encircled by towering walls built to ward off pirates, Cartagena remains as mythical and magical as Gabo’s best books. Though sidestepped for years by many American travelers, Colombia is now a “new beacon of stability in Latin America that’s peacefully shedding the nightmares of its past for a greater future,” says Ashish Sanghrajka, president of Big Five Tours & Expeditions. Take, for instance, the 2016 Nobel Peace Prize, which was awarded to Colombian president Juan Manuel Santos for helping to broker an accord that ended a 52-year conflict with the country’s rebel forces. For anyone who’s put off visiting Colombia, and for those hoping to follow Gabo’s footsteps in Cartagena and beyond, now’s the time to make the pilgrimage. Your travel advisor can help craft a customized journey that includes a walking tour of up to 30 locations significant to his life and works. Here are eight to get you going. 1. THE CLOCK TOWER: In 1948, García Márquez, then a 21-year-old journalist, first entered the Old City through the tower’s portal. Decades later, in his autobiography, Living to Tell the Tale, he would remember that moment: “It was enough for me to take a step inside the wall to see [Cartagena] in all its grandeur in the mauve light of six in the evening, and I could not repress the feeling of having been born again.” Inside the tower, Los Martires bookshop sells first editions of his works. 2. SIMÓN BOLÍVAR PARK: It was on a bench in this public square named for South America’s “great liberator” that a pesoless García Márquez slept during his first night in the city. 3. ANIMAS BAY: Fairs García Márquez once frequented at Bahía de las Ánimas (Bay of Souls) inspired One Hundred Years of Solitude’s gypsy market, where Melquíades revealed his metal ingots, which he called the “eighth wonder of the learned alchemists of Macedonia.” This year marks the 50th anniversary of the author’s seminal novel. 4. PLAZA FERNÁNDEZ DE MADRID: This leafy plaza was the model for the Park of the Evangels in Love in the Time of Cholera, where protagonist Florentino Ariza famously pined for Fermina Daza on an “obscure park bench” shaded by almond trees. Near the plaza’s northeast corner, look for the heroine’s white house and vine-clad second-story balcony. 5. SANTA CATALINA DE ALEJANDRÍA CATHEDRAL: Dating to the sixteenth century, Cartagena’s iconic landmark was the site of Fermina Daza’s marriage to Dr. Juvenal Urbino and, later, Urbino’s funeral. 6. PORTAL DE LOS DULCES: Shop for locally made sweets in this arched passageway (called the Arcade of the Scribes in Cholera), where Fermina Daza rejected Florentino Ariza just after he first called her “the crowned goddess” – vendors here now sell candy by the same name. 7. EL CORO LOUNGE BAR: García Márquez once reported on the bones of a girl with 72 feet of copper-colored hair, found in a crypt within a former convent now reborn as the haute Sofitel Legend Santa Clara hotel. The experience would later inspire Of Love and Other Demons. Today, the crypt is still accessible (sans skeleton) in the hotel’s bar. Just across the street stands García Márquez’s seaside home; the writer wintered in Cartagena – and bent his elbow at El Coro – until his death in 2014. 8. UNIVERSITY OF CARTAGENA: Cap your tour with a visit to the school’s Claustro de la Merced, where a portion of García Márquez’s ashes lay in rest near his sculpted bust. FROM THE TOP: Perched hillside on the city’s highest point, Convento Santa Cruz de la Popa (founded in 1607) offers lofty views of the Caribbean, along with both the historic and modern sections of Cartagena. Plan to browse the convent’s chapel and courtyard too, “but be there early to beat the cruise ship crowds,” says Beaufort, South Carolina-based Virtuoso travel advisor Connie Valimont. BUEN PROVECHO: For a twist on Colombia’s beloved carimañolas (yucca fritters typically filled with meat or cheese), head to La Comunión, where chef Charlie Otero tints his shrimp-stuffed fritters black with squid ink. Long lines are worth braving for the ceviche and tropics-inspired paella at La Cevicheria, brainchild of Jorge Escandón, the chef who famously introduced Anthony Bourdain to Cartagena’s culinary side in an episode of No Reservations. RELIGIOUS EXPERIENCE: Ask Colombians to identify their country’s main faith, and the answer almost invariably is “football.” Valimont advises soccer fans to plan a visit around one of the national team’s World Cup-qualifying matches (multiple dates through October 10, 2017) to take in televised games at their hotel bar or a nearby watering hole (imperative: wear Colombian yellow). To watch professional teams battle, have your travel advisor book tickets to a match at Jaime Morón León stadium. BRING BACK: Coffee and rum. Café San Alberto offers elaborate tastings and sells Rainforest Alliance Certified coffee grown at its hacienda in Quindío (part of the country’s Coffee Triangle). Set aside additional suitcase space for coastal Colombia’s favorite spirit: Two well respected rums are Cartagena-made Gobernador and La Hechicera, distilled in nearby Barranquilla. Avianca operates daily nonstop flights to Colombia from six U.S. cities, plus connections to 22 destinations within the country. Working with your Virtuoso travel advisor, Big Five Tours & Expeditions crafts customized Colombia experiences – everything from tracking endemic birds in the Amazon to tracing Gabo’s path in Cartagena. A new 13-day journey from the company includes three nights in the city, along with visits to the country’s capital, Bogotá; UNESCO-designated San Agustín Archaeological Park; and Caño Cristales (“the river of five colors”). Highly suggested at the 30-room Casa San Agustín, a boutique hotel reimagined from three colonial-era homes: reposing on its rooftop terrace and swimming in its courtyard pool, which is gracefully framed by remnants of Cartagena’s historic aqueduct. Virtuoso travelers receive a room upgrade (if available), breakfast for two daily, and a $100 dining credit. A former convent dating to 1621, the Sofitel Legend Santa Clara features 123 rooms with city, sea, and courtyard views, including a Fernando Botero Presidential Suite adorned with the Colombian artist’s paintings and books. Look for historical crypts and confessionals amid contemporary touches such as an 8,600-square-foot spa. Virtuoso travelers receive a room upgrade (if available), breakfast for two daily, and a $100 dining credit.